There is a current trend with today’s festivities that revolve around marriage, whether the proposal, the actual wedding or anything in between, to bombard the location with every bit of detail that coheres to the theme. Not only to look celebratory and festive but also to look lavish. Although not entirely gone, but gone are the days when people planning to get married opt for simplicity, simply because of the “instagrammable” mentality— that the more packed it is with details, the more it works for social media. There is certainly nothing wrong with it, as it also provides an opportunity for people to get extremely creative. Creative in a way they seek features that other couples have not used or done. One of the features that is considered unique in any events are the banners. By definition, a banner is “a long strip of fabric bearing a slogan or design”. It is commonly hung on a wall or at the ceiling to relay what the event is all about. You may also see wedding banner templates. Marriage is a celebration of love, so it is just fitting to have designs that exude a celebratory vibe in them. With that said, if you are someone organizing an activity that revolves around marriage and is seeking for the most creative banners to use, here is a list you can choose from. For marriage festivities, the most common way to use a banner is to write a witty phrase or something related to the activity. Banners are indeed perfect for any kind of marriage festivities. Whether during a proposal, a bridal shower, an engagement party or the actual wedding day, you can most definitely use a banner to spice up your setup. For the proposal, a guy can maybe pop the question to the girl by writing down the words “will you marry me?” on the banner. For bridal showers (or even groom showers if there is such a thing), you can maybe put in “soon to be Mrs.” or “I’m the groom; I’m the groom too”. 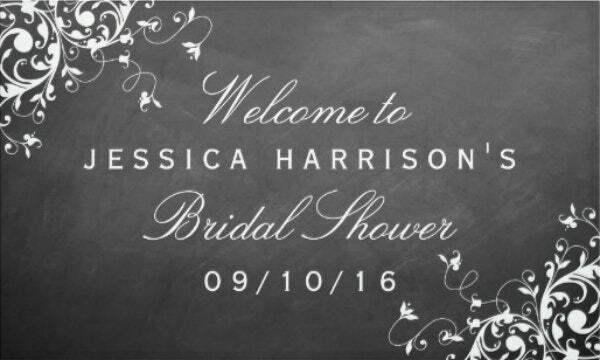 And for both the engagement party and the wedding day, you can use a banner to welcome the guests upon their entry to the location. Given that a banner can be used to welcome guests at any activities, it can most definitely set the mood during the whole course of the event or activity. Banners have the capacity to stimulate positive emotions to the guests, like excitement, joy, and love. You may also see wedding welcome banners. Banners, given its creative nature, can be added as a design element to your activity or event organized. It will simply add to the plethora of other design elements in your event that will elicit a well thought of and well-planned activity or event. A banner is a medium that bears designs, but it can also be a medium that can relay information. With that in mind, knowing how some guest in an event or activity tends to roam around to ask questions about certain designations, a banner can help keep the formality of the event intact with the information it contains by ushering guests in an organized manner. It will simply keep the event organized and will keep disorganization to a minimal. You may also see wedding banners. The beauty of having design elements in any event that bears designs and information related to the event being organized is that you get to keep it for keepsakes. You get to look back on it at times of solitude and reminisce about the beautiful memories the design element entails. You may also see beautiful wedding banners. How To Best Acquire Your Very Own Marriage Banner? There is an indefinite way with how you can acquire your very own marriage banners, depending mostly on where your simple budget takes you. You can have it custom made by a professional graphics artist, do it on your own, or simply buy one that is premade and readily available online. Although all of these options are equally capable of providing you the banner needed for your event or activity, there is simply one out of the three that is more ideal to go for as an option. With that said, let us go through the pros and cons of each option. You may also see wedding invitation banners. 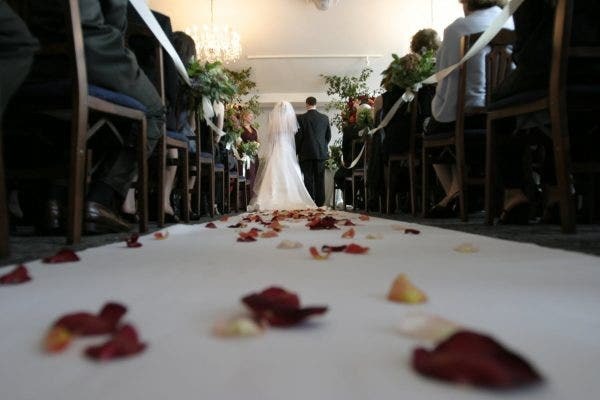 Having your marriage banner custom made by a professional graphics artist is essentially an option that is fancy. The very idea that someone else will do the job for you is what gets people who opt for this option most of the time. Although it is a stress-free option as you are not the one doing most of the works, the price point simply does not cut it. Having it custom made is essentially expensive given that there are certain factors that are being considered. These factors altogether matter in the end as it decides the affordability of the work done by the graphics artist. As such are, the different consultations that will take place prior to the actual making of your marriage banner. You may also see sample banners. Most graphics artists do this to get the full idea of what their clients want— the specifications, the design, and the overall look of the banner. Then there are the different resources a graphics artist will use in the making of your banner. Which will range from the different design software a graphics artist will use up to the different kinds of printer that will be used for printing. Even the kinds of fabric to be used to create the banner also matters. And lastly, the numbers of hours one will have to spend creating your marriage banner. You may also see printable banner templates. Considering the demands and the numbers of other works and projects a professional graphics artist have, it is inevitable that they sometimes will have to deprive themselves of sleep in order to finish what needs to be finished. Taking into account how intensive the work gets, it is to no surprise that the fee of the artist skyrockets to a point of impracticality. You may also see engagement party banners. For choosing to do it all on your own, or as the millennial slang goes, DIY or “do it yourself”. This option can be very affordable, only because you can be truly resourceful in making your own marriage banner. You can simply look around for old-scrap fabrics and simply write down what needs to be written on it and voila! You have your very own banner. Although it can help let your creativity flourish and come through, sometimes doing it all on your own can be a little sloppy, and it might not look as finished as how you want it to be. Yes, it can a very affordable option, but you do not want your events or activities to look like the designs were made by a second grader. You may also see banner templates. And lastly, for choosing to simply buy one that is premade and readily available online, you can have the best of both worlds. You can have it partially made by graphics artist and have the liberty to do whatever you want with it. Also, it comes at an affordable price which makes this option even better. The reason behind this is premade banners are made according to the artist’s preference. No demands, no guidelines to follow. And because of this, the premade option is usually priced affordably, without having to compromise quality. But aside from its affordability, there are also other reasons to why a premade option is ideal. You may also see sample welcome banners. Premade options are also very easy to work with in terms of its workability. Not just because it comes in a file that is easy to edit and customize, but because of how simple it is by nature. You do not need to have extensive knowledge of design software or design in general, all you need is a ton of creativity and you are good to go. Speaking of its editability, premade options are fully editable and customizable to your preference; you can edit the banner to the way you want it to look. You may also see word banner templates. Premade banner designs and templates are fully editable and customizable from texts, fonts, colors to sizes, and even a few of the other elements. 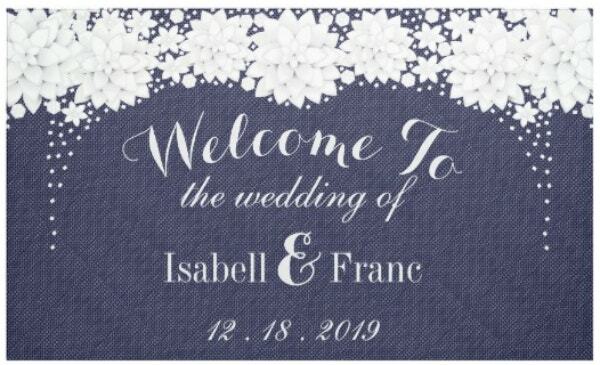 Sometimes, it comes with smart object layers or vector files that enable you to move around elements of the designs creating a more unique-looking and more personalized marriage banner. Premade banner designs and templates also come in many different design variations. There are simple designs and template and even minimal designs, there are also floral designs and templates, but also modern designs. There is definitely one for every different preference that will perfectly work for any marriage festivity. To conclude, the best way to acquire your very own marriage banner is by simply buying one that is premade and readily available online. Not only because of its affordability but also because it comes with advantages that help make it an ideal choice. You may also see bridal shower banners. If you find this article helpful in any way, do not forget to bookmark this page for future references. And, kindly share this with other individuals seeking for marriage banners to use. You may also see welcome banners.